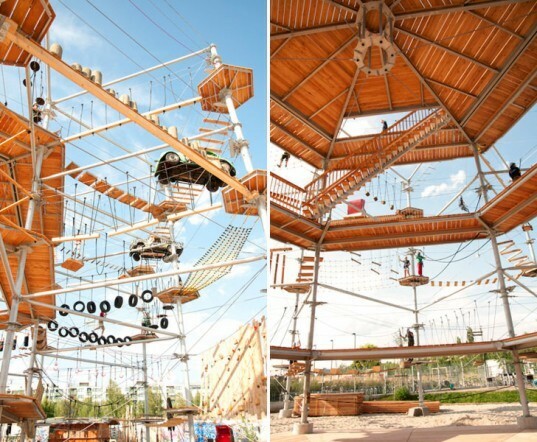 There is a spot right in the heart of Berlin where people can climb through recycled objects, play beach volleyball and enjoy a day full of outdoor sports and fun. Called Mount Center, the urban park is located in Mitte – the German capital's trendiest design area. 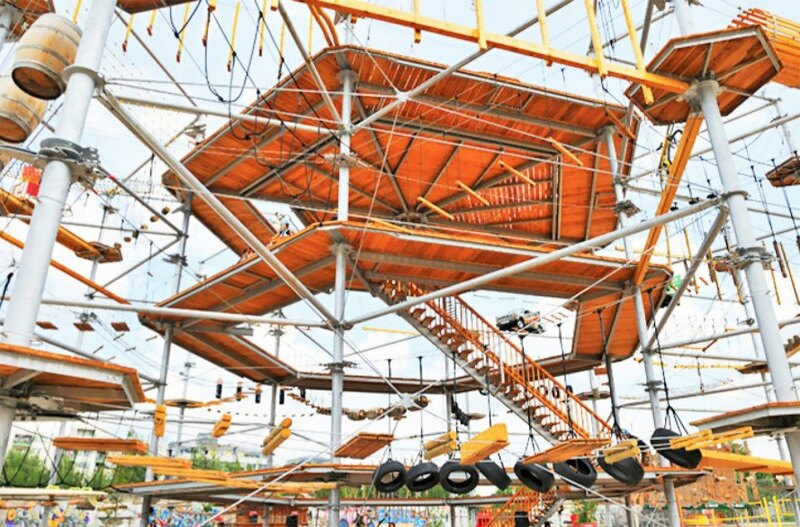 Mount Center's main attraction is a gigantic parkour course that can be spotted from the street and offers high-flying ropes and a variety of recycled objects for climbing on. Berlin’s amazing Mount Center opened in 2010 next to a wild park, meters away from the Nordbanhof S-Bahn train station. After a short training session with an experienced guide, visitors are welcome to climb the grand parkour area and discover six different courses with different difficulty levels and altitudes. The recycled area is 43 feet high and features a mix of classics cars (including vintage German Beetles and East German Trabants), repurposed barrels, tires, wood and ropes. The Beach-Mitte area provides a sandy environment to play beach volleyball against the backdrop of concrete buildings. The Hawaiian-themed Beach Bar offers a two-story transparent pavilion for enjoying cool drinks and tasty food. The bar is decorated with a colorful collection of lamps made from recycled plastic containers, driftwood and vintage lights. Berlin’s fun and sporty Mount Center is also great for kids – it has a cool beach playground featuring a cute wooden Noah’s Ark. Berlin's amazing Mount Center opened in 2010 next to a wild park, meters away from the Nordbanhof S-Bahn train station. After a short training session with an experienced guide, visitors are welcome to climb the grand parkour area and discover six different courses with different difficulty levels and altitudes. The recycled area is 43 feet high and features a mix of classics cars (including vintage German Beetles and East German Trabants), repurposed barrels, tires, wood and ropes. The Beach-Mitte area offers a sandy environment to play beach volleyball against the backdrop of concrete buildings. The Hawaiian-themed Beach Bar is the newest attraction, offering a two-story transparent pavilion for enjoying cool drinks and tasty food. The bar is decorated with a colorful collection of lamps made from recycled plastic containers, driftwood and vintage lights. Berlin's fun and sporty Mount Center is also great for kids - it has a cool beach playground featuring a cute wooden Noah's Ark. Berlin's amazing Mount Center opened in 2010 next to a wild park, meters away from the Nordbanhof S-Bahn train station. After a short training session with an experienced guide, visitors are welcome to climb the grand parkour area and discover six different courses with different difficulty levels and altitudes. 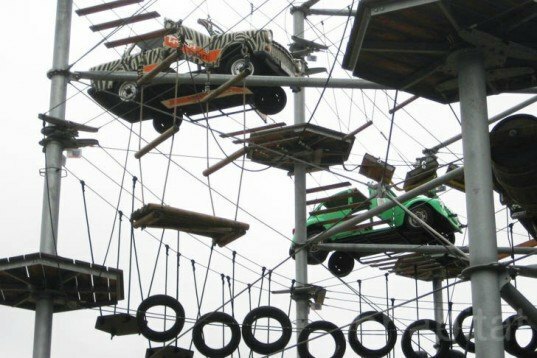 The recycled area is 43 feet high and features a mix of classics cars (including vintage German Beetles and East German Trabants), repurposed barrels, tires, wood and ropes.